They threw a birthday party for Andrew Jackson last month in the Waxhaws.1 The local museum offered cake and punch, hung balloons and hired an actor to greet visitors in the role of Old Hickory in his later years. The actor spoke with a slight Northeastern accent, but Jackson probably didn’t speak with what we’d recognize as a Southern accent, anyway, and at least the actor looked a little like Jackson: tall and lanky, with a long face and jutting cheekbones. The actor was suitably well-mannered2 and remained committed to the part, although I did overhear him talking with a family about the NFL. His most obvious shortcoming in playing Andrew Jackson was also the most forgivable, the one most any actor would face, the one that can hardly be fixed: had the party turned ugly, I would not have been physically afraid of that man in the museum. The real Jackson, meanwhile, though he was noted for his surprising social grace, must have been utterly, viscerally, wet-your-pants terrifying. Imagine trying to have a pleasant little chat with the holder of the most powerful office in the young nation; a man who wielded the full power (and then some) of that office like no one before him3 and very few since; a man whom the wilderness, Tories, a British saber, smallpox, malaria, numerous duelists, multiple gunshot wounds, entire Indian nations, and the first would-be presidential assassin in the U.S. had notably failed to kill; a man who had ordered or caused the deaths of thousands, and had himself killed more than a few while staring them in the eyes, and who – as president, and an unwell old man – would have beaten to death that would-be assassin if aides had not restrained him. He must have warmed rooms through sheer intensity. He may have been deranged. He was both the prime example and the grandest exaggeration of Dixie manhood, a veritable playground of the vices and virtues that created the Old South, and continue to shape the New. Jackson could have claimed to have created the South. Not in his own image, for he was already a reflection of an existing South, but he played first an active, then a primary, role in opening much of what we think of as the South to what we think of as Southern culture. As a boy in the Carolinas he fought the British and the Tories for the cause of independence; as a young man he played a significant part in the settlement and defense of Tennessee. The white settlement and eventual statehood of Alabama, Florida, Mississippi east of the river, and Georgia west of Macon happened because of him and his generalship. 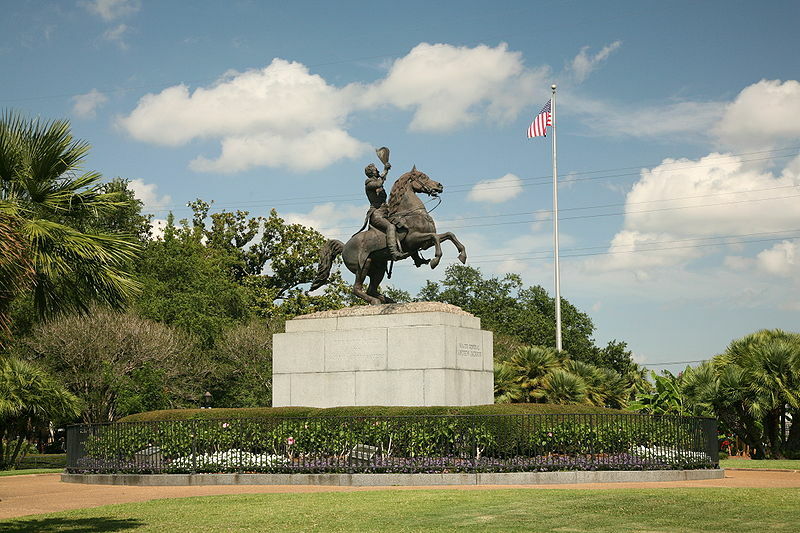 He took the Black Belt from the Creeks and Florida from the Spanish, and secured New Orleans as an American port once and for all. Southerners of a certain cast of mind want to see Robert E. Lee as their model and embodiment, all ancient blood and martial dignity. These Southerners tend to ignore quite a bit about Lee – his upbringing in genteel poverty, his father’s time in debtor’s prison and exile, his marked graciousness and even repentance after the war, the crushing sadness of his eyes in almost every late portrait of him5 – and hold him up as the symbol of all that the Southern gentleman was and should be. These were the men from whom Jackson came, the men who followed him in war and voted for him in elections. In a time and a place dominated by men like that, a time and place full of men, women, and children who had to be hard as coffin nails just to reach middle age, Jackson was renowned as unbreakable, ferocious, volcanic. He was like them and of them, only somehow more, as if he’d been given a double measure of their raw materials, or made by a hotter fire. These episodes capture what set Jackson beyond the normal run of men, even in the volatile and violent South. For all his fire, Jackson’s ferocity had a settled, studied side to it. If most in the Southern backcountry applied their fierceness to what Cash called “whim,” Jackson demonstrated a self-mastery that subjugated the enactment of his whims to the service of higher purposes, usually his honor, often his ferocity itself. If Jackson knew life as nothing but grim struggle, enlivened by the occasional war, he had cause. If he came to see enemies all around, all out to get him and/or his beloved America, he had his reasons. 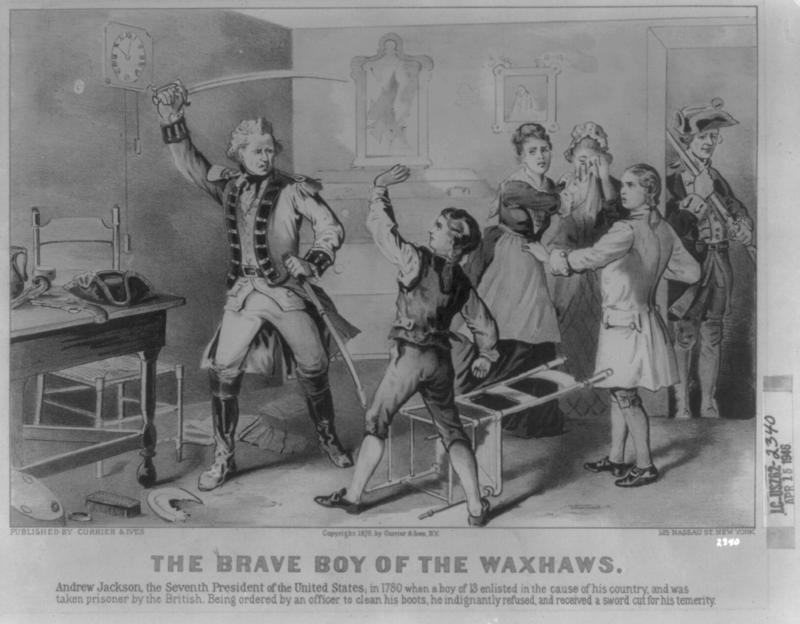 He was born fatherless on the frontier; before he was 15, the British had scarred him, imprisoned him, and caused the deaths of his mother and brothers; he came to Nashville and began his career in the midst of the terroristic wars with the Chickamaugas and Creeks, just 8 years after the Battle of Fort Nashborough almost wiped out the young town. He blamed the calumny of his political opponents for the death of Rachel, the wife he adored, just after his election to the presidency. So dark was his subsequent depression that he delayed leaving for his own inauguration, and those closest to him feared for the sanity of the president-elect. Stop me when this sounds familiar, those of you who know the South: good manners failing to hide an explosive rage, a boisterous love of contests of strength, an obsession with personal honor, a quickness to see disagreement as affront if not threat. Old South manhood, hell; the New South is full of petty Jacksons, raised in and dedicated to his vices, lacking his virtues of absolute courage and steadfast moral code. He was raging and bullying and frequently wrong, but he so dominated his era that it is the only period of American history we know by the name of an individual, the Age of Jackson. Yet much of the South, to one extent or another, repudiated him, especially as the South solidified around states’ rights and secession and war.11 Jackson had vanquished John C. Calhoun and his Nullifiers, the forefathers of the Confederate notions of states’ rights, and had insisted on the primacy of the Union and the federal government. In the politics that led to the Civil War – politics confused with the personal, politics that would spur South Carolina Representative Preston Brooks to cane almost to death Massachusetts Senator Charles Sumner on the floor of the Senate12 – Jackson’s vehemence that “the Union must be preserved” cast the founder of the Democratic Party, long after he was dead, among Lincoln’s Republicans, which made him less than a full Southerner. No true Southern man, said the loudest Southern men of 1860, would fail to join his personal honor to the imagined injuries done to his native land, the continued profitability of the plantation economy, and race-based slavery. Then the defeat and Reconstruction and the myth of the Lost Cause shifted and hardened the South’s focus, and a whole pantheon of Southern heroes – Jackson, Jefferson, Decatur, even Washington – faded into the background, ignored in the Dixie-fried imagination in favor of those who wore the gray.13 The greater nation was happy to claim them. Their excellence, and their flaws, remained, though; the Age of Jackson stayed his. Andrew Jackson never feared the opprobrium of his neighbors. He dueled and roared and conquered, holding his iron notion of honor above all else, and none of it depends at all on our memory. To forget or diminish his deeds – his triumphs and his crimes – diminishes us, not him. His life and character remain outsized, and peculiarly of the South, whether the South he carved out admits it or not. 1 Jackson was born in the Waxhaws, either on the North Carolina side where the museum is, or a mile or two away, across the South Carolina line. The two states still dispute it – well, a very, very few people in desperate need of better social lives within the two states still dispute it. 2 Those who met Jackson after he was famous always seemed to expect a frontier savage, and were always shocked by his courtly manner. After the Revolutionary War orphaned him, Jackson made his way to Charleston, and spent too much time drinking and gambling with the city’s young gentlemen; biographers speculate that he learned his refined manners there. Jackson’s family, though, despite their humble circumstances, taught young Andrew to think of himself as a gentleman. 3 Keep in mind that the presidents who came before him included Thomas Jefferson, John Adams, and George “Father of his by-God Country” Washington. 4 He’s in the top three of most badass American presidents. Only Teddy Roosevelt and George Washington were as intimidating, as physically courageous, and as willing and able to beat the ever-living snot out of you. 5 They also tend to call it “the War Between the States” or the “War of Northern Aggression” or some such nonsense, ignoring that Lee himself called it the Civil War. 6 Cash made much of the South’s “yeomen” in The Mind of the South. He was trying to puncture the myth of the “Southern gentleman,” but he ended up helping to create a new, differently pernicious myth – after the Civil Rights Era, it suddenly seemed that every white male in the South was descended from this yeoman class, mainly so they could claim that their ancestors “never owned slaves.” It became a convenient way of asserting long and proud Southern heritage, while avoiding familial culpability. 7 When Faulkner sent Malcolm Cowley his “Appendix: The Compsons” for The Portable Faulkner, Jackson was the only non-fictional figure he saw fit to include. I have to wonder how much Faulkner knew about Jackson, or how much Jackson was on his mind, when he created Thomas Sutpen. 8 I’m surprised Faulkner didn’t call him “implacable,” too. “Implacable” was one of the novelist’s favorite words, and if anyone ever was implacable, it was Jackson. 10 Read that paragraph again. Now let someone, say, throw a dart at you, and don’t flinch or dodge or shriek like a little girl. 11 This repudiation was never official or absolute, of course, and middle Tennessee clung to him fiercely. 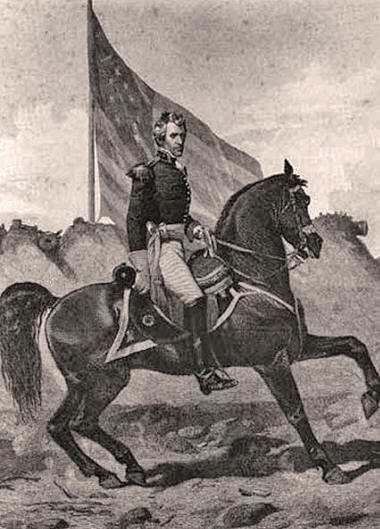 He was a war hero, a planter, a slaveowner, a hater of Indians, a lover of fast horses, and a Democrat – so he couldn’t, to a Southerner, be all bad. Boy Scout troops in western North Carolina are organized into the Old Hickory Council; but the nicest hotel in the area, until 1972, was called the Robert E. Lee. 12 In May 1856, Sumner said that S.C. Senator Andrew Butler kept as a mistress “the harlot, Slavery.” Brooks, who was related to Butler, took this as an insult, and attacked Sumner three days later. This may seem Jacksonian, but Brooks sucker-caned him; Sumner was unarmed, and – understandably – not expecting to be assaulted in the Senate chamber. Jackson never did anything so base and cowardly. 13 I find it telling that the Museum of the Waxhaws, dedicated to the story of a small region that was of genuine significance to the Revolutionary War, and was the birthplace of Andrew Jackson, devotes as much space in its permanent exhibit to the area’s negligible participation in the Civil War.